Hi guys! I just got back from Spain for the Pull&Bear event so I'm just sorting all my photos and footage. Haha I have some funny stories! I'll also pick up the 30 Day Challenge again as it's nearing the end, which means I'm nearing my final exams, eeek! I've been at uni for four years now so I made a revision tips video that might help you if you are in the middle of revision too! I watched FleurDeForce's revision video last year and it really helped, and I just found this great video by SuperBeautyNerd which has a good tip on highlighting things you don't quite fully know in different colours; I always seem to skip past things I don't understand! 1. Watch other revision tips videos! 2. Get a separate revision notepad and lots of colourful felt tips. 3. Sort all your notes and papers into sections/topics/modules. 4. If you find it hard to revise at home, get to the library! Take a friend if you don't want to go alone. 5. Get all your distractions (Facebook/Twitter/Blogs/YT/Tumblr) out the way early in the day! 6. Don't depress yourself! Revise when you know it's the best thing to do. 7. Make a list of all the little steps you need to take for each subject and chop and change- remember to tick each thing off! 8. Do the recommended reading and beyond. 9. Find out the exam style and how to get the best marks- new journals? historical knowledge? original ideas? 11. Get good food for brain power! Have treats too to keep motivation up. 12. Get enough sleep- not too much, not too little. 13. Condense all your notes into readable chunks. 14. Make yourself questions on flipcards so you are actually learning what you are revising. 15. Do the practice exam questions and ask if you can show them to your teacher/lecturer. 16. Answer the question, don't just write everything your lecturer has taught you. Be critical. 17. Do your research and back up points- don't assume anything. 18. JUST DO IT! Do that little bit that you know you will have to do eventually, and then worry about the rest after that's completed. Just keep repeating this step! I totally didn't get a foundation when I had a MAC makeover on Saturday, I can get that any time! I just said do something dramatic with dark eyes as I was going out, so the makeup artist did toootally black eyes and bright coral cheeks with a red/coral lip. Also apologies for photos in the Bullring toilets! I just wanted to get some photos right after haha! 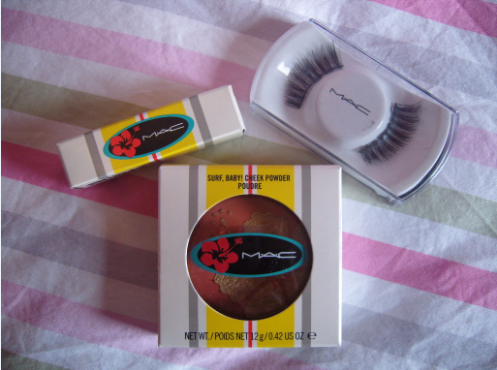 I did take some lashes but apparently they really have to be MAC ones that they use so I got a pair of theirs and got the blush and lipstick because they're limited edition! I've read on a few blogs that people weren't really fussed with the Surf, Baby! collection as the stand out colours are greens and oranges but everything else is coral, which is right up my street. Also I used to wear a really orangey-red lip if I ever wore red lipstick, but since my hair is darker, I wasn't sure what to do! 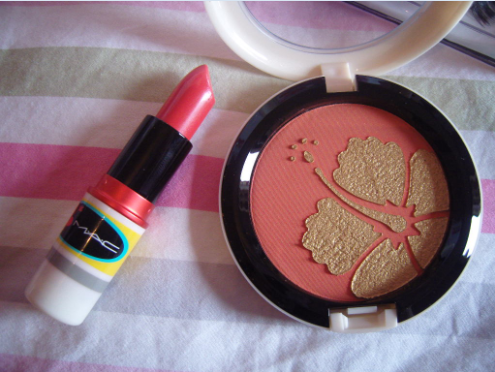 So I got Hibiscus, a rich coral-red that looks great with dark eyes and warm cheeks. 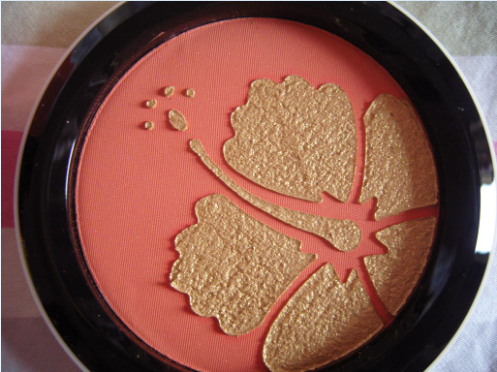 The blush is a gooorgeous popping coral, much brighter in real life! I'm not sure how to use this as the gold shimmer is just an overlay so will use up quite quickly. I might swirl a bit in so the blush has a little shimmer for now, as the gold is a bit too yellow for a highlight. 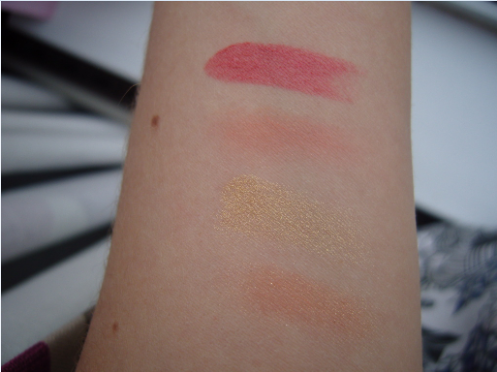 These are swatches of the lipstick and then blush, the shimmer, and both swirled together (top-bottom). So check out the collection if you love corals, I hope it gets more love! The blush is sold out online and I got one of the last ones at that counter, but I'm sure there are a few more floating around. Oh no, I missed a day of the challenge! Yesterday I was in Bristol and then came back to Manchester in the evening from home so I could wake up here today. I'm going to Spain for the Pull and Bear event tomorrow so I've got to pack and sort everything out! Hectic! 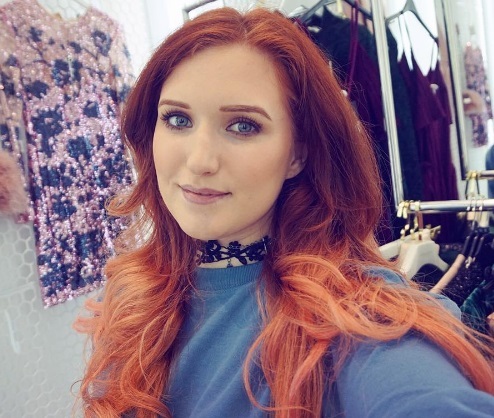 It's only literally for one day but I've just found out a lot of the other bloggers going have quite different sort of blogs to mine, more like the kind with lots of self portraits and photos from clubs. I think it will be totally different to the few blog events I've been to before so we'll see! I took these palazzo trousers to a tailor over a week ago so I bet he thought I was never coming back! 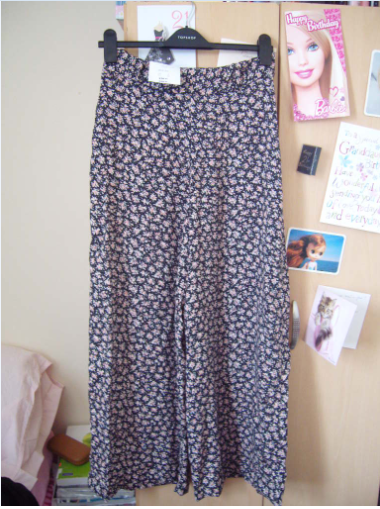 I got them short enough to wear with flats so maybe they are comfy aeroplane wear? I've watched loads of YouTube videos that say to take off your makeup when you're on the flight and put it back on before you get off. I might do this with just my base but I think eye makeup is a bit far! I think this is a really weird question as the only time you'd be wearing the same clothes as someone would be as part of a uniform or maybe a dress-up event! But never the less, here is a picture of my sister Chloe and I during a time when we did wear matching clothes, probably just because that's what my Mom put on! I took it from a post in 2008 (woah) with loads of old family pictures. Haha in there is a classic of my sister when I saw mud baths on Blue Peter and covered her face in Sudrocrem hahaha! 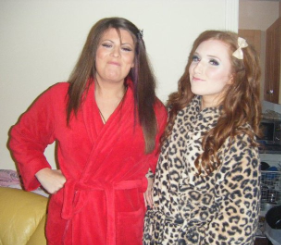 Also below is a picture of my housemate Sophia and I in dressing gowns just before T-Shirt Time (I hope you get the reference!). Haha we always pull this proud school photograph pose for pics, and this photo also shows why you shouldn't buy Estee Lauder Double Wear foundation as your face will look absolutely chalk white in photos!! Thank God I just went through a few samples before realising! I've had so many new purchases over this past month! 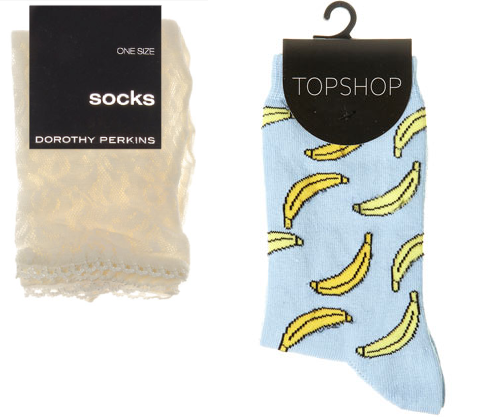 And I'm home right now so I really want to check out Forever21 in the Bullring before I go back to Manchester. I need to make some progress with my exam reading too, although I made a start in Easter so I'm on the way. My MAC makeover was fab yesterday and I didn't even get the foundation! I got two things from the Surf Baby collection, I'll post them soon! I was thinking of getting the foundation in duty free next week, eee exciting! I went to the new club Vudu in Birmingham, where Subs moved to if any of you know it. I think it's cool how they have these raunchy, almost naked girls that dance on the stage and hand stuff out, but they all have tattoos and piercings! It was weird to have that night in such a new, clean club, but on the way out I slipped totally over on a wet bit on some stone floor at the entrance and the side of my leg hurts so much!! I never fall over in clubs and my Forever21 Mary Janes are super sturdy despite being high! I know I'll get a giant bruise and my skin is even cut because I fell so hard! I might send them a picture because a floor like that wet is a really bad idea! Oooouch! Anyway, I got the coach back home on Thursday and, while they are a scramble to get on and get a decent seat, they are much better than the train! I suppose you are constantly alert on a train but a straight coach gets you from A to B without lots of little stops and trolleys and seat reservations and announcements. Maybe I've just got the Manchester to Birmingham train so many times that it's crazy! The coach stop is near a H&M so I popped in because I'm trying to get hold of the bright coral version of the yellow bra above. I can't find my size anywhere so I got the yellow one, as a fluro or patterned bra is great if you can see the straps under smaller summer tops or sheer tees. This satin flower set was also super cute, and it makes you feel much better if eeeverything you're wearing is pretty and great quality. Wow, nearly the middle of May already! I am just revisingrevisingrevising at the moment but I'm going out tonight and getting a MAC makeover before as I need a new foundation! I'm not even 100% I will get the foundation but we'll see! 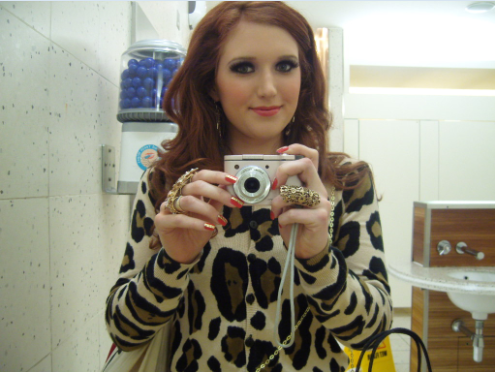 I love the MAC concession in the Bullring Selfridges so was lucky to get a late appointment on a Saturday. Speaking of cute socks, it's almost a travesty that I haven't worn lace socks with my flowery Forever 21 Mary Janes! 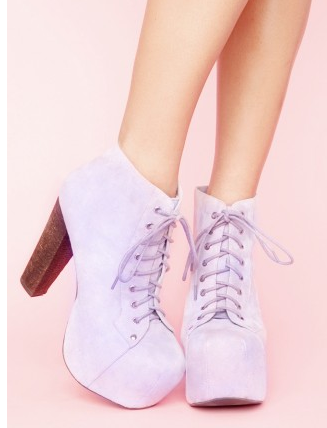 They do run the risk of looking twee but I think they would definitely be a perfect addition to the shoes. 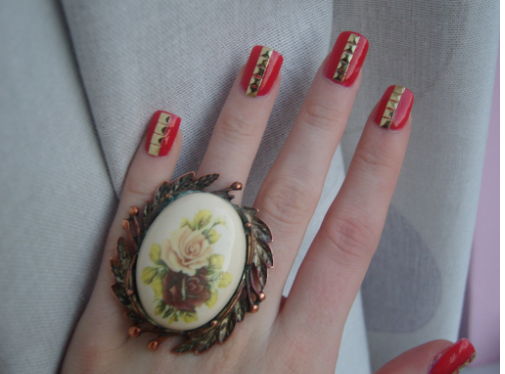 A double whammy of nails this week! My first nails were with Gosh Lavender, a gorgeous Barbie purple. I got some icecreams off eBay to stick on; they're so cute! 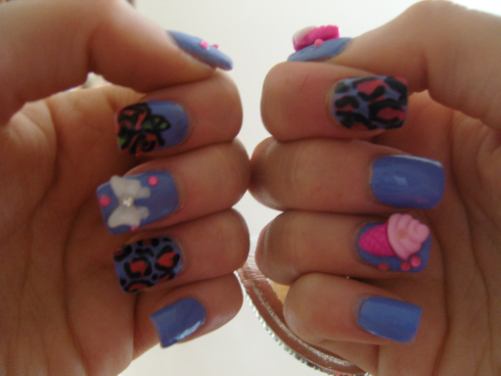 I had a mini Hello Kitty on my thumb too but it fell off, and due to previous nails, these were quite battered. Hence why my nail photos are usually from fairly far away of not too focused, and I use seriously thick coats of polish... unlike the photo below! I said yesterday that I was browsing Topshop in the Manchester Arndale and saw a WAH nails pop-up desk, which seemed the ultimate post-dissertation treat that wasn't buying more clothes or makeup. If you are in Manchester, you have to check it out!! It's definitely there until this Saturday, and it may carry on. The nail artist is fabulous and it felt like I was only in there for about 5 minutes because we gossiped about nails for ages. Her name is Mackenzie and she has a Tumblr, yesss! See if you can spot my nails! 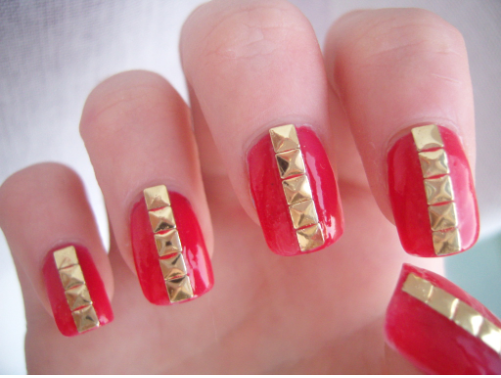 I chose to get the studs and they feel sort of ghetto-fabulous, they just feel super cool! The polish and the studs are really shiny so they catch the light all over the place and it's very nice to actually have neat nails for once. The polish is a bit more coral in real life too, I think I am coral obsessed!